So you’ve decided you want to travel to the Sunshine Coast for a vacation and perhaps do some hiking or mountain biking. Here are some important things you need to know about traveling to the Sunshine Coast. The first, and probably most important thing to know, is that you can’t get here by road alone. Although we are not an island (a lot of people think we are either part of Vancouver Island or another island like it), there are no roads that will take you from the lower mainland area to the Sunshine Coast. 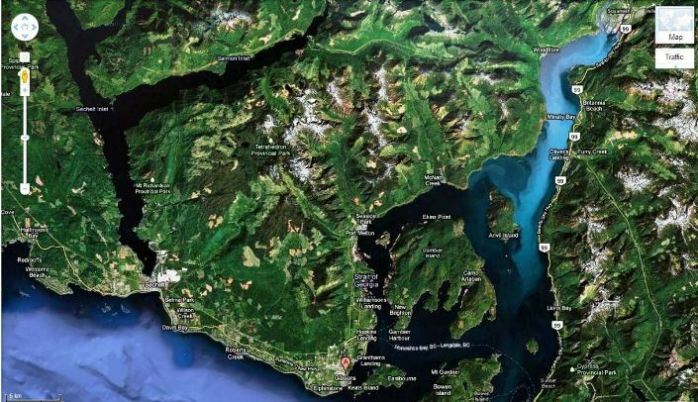 If there were a road it would connect from up around Squamish and down through Port Mellon. I understand there are old logging roads that go right through, but I’ve never met or talked to anyone who has ever done the trip in a 4X4 or other off road vehicle. Here’s a photo of what the geography looks like. Click on the map to open a higher resolution pdf document. Secondly, the Sunshine Coast is well worth the trip and actually it isn’t too much of an effort. By ferry, we’re only a 40 minute ride from Horseshoe Bay in West Vancouver to Langdale. By air, it depends on where you fly from. You can fly by float plane from Vancouver Harbour to Sechelt in 20 minutes, from Nanaimo Harbour to Sechelt in 15 minutes and by small plane from Victoria to Wilson Creek in 33 minutes. Third, you can bring your car on the ferry, but for obvious reasons not on one of the flights. This makes the ferry the most appealing option for many who travel to the Sunshine Coast - especially those with families or a lot of gear. It is also the most economical for more than one or two people. BC Ferries has ferry service to the Sunshine Coast seven days a week, from early morning til mid evening. Check out their schedule for detailed information. Also something to note is that you pay for both ways at Horseshoe Bay on your way over. You will not pay again when you leave from Langdale. Here is a link to the current fares (remember this is return trip cost). Keep in mind that during the summer months between May and September the ferries can be very busy – especially on weekends and long weekends. If it’s a Friday leaving Horseshoe Bay or a Sunday (or Monday on long weekend) leaving Langdale, you can expect a wait at the ferry terminal unless you’ve made reservations. Reservations can be made online or by phone at 1-888-223-3779 and require a credit card. There is a $15.00 charge per vehicle for reservations more than 7 days in advance and a $17.50 charge per vehicle for each reservation made less than 7 days ahead. Here's a handy tip: If you are traveling from Horseshoe Bay on a summer Friday try and catch the 3:45 pm ferry. There is a 4:30 pm ferry right after and even if you don't get the earlier one you will likely get the next. There are a couple of ferries scheduled close together on Sunday for the return trip as well. Click here for more information about travel to the Sunshine Coast by air or on the navigation button on the left. Click here to return from Travel to the Sunshine Coast to the Sunshine Coast Home page.